I am installing concretes porches in the front and rear of my home to replace wooden decks. The front exterior wall is stone and the new porch would extend up over the stone wall at the bottom. Should the stone be removed to have a straight edge flush against wall, or is it ok to pour against the stone wall (bedding them into the porch)? What would you recommend as the process for both? I agree with Tyler Durdens advice,with one important addition. Don't lay your patio directly on gravel. Assuming your patio is about 75-100mm deep, gravel on its own will not offer enough support, and eventually, cracks will appear due to subsidence. A much better solution would be to "layer" your foundation in order of aggregate size. Lay a layer (or two) of large stones,followed by a layer (or two) of medium stones, DON'T FORGET TO TAMP THEM DOWN!!! !, followed with a layer of sharp sand,tamp down again,then gravel(tamp),then patio. You typically want the pad to be seperate from the building to prevent movement of one from cracking or damaging the other (and it will happen). That typically would be an expansion joint type gap that is filled with sikaflex or similar goop. I'm unsure how rough the wall is. But perhaps you can use something like this that will contour to your wall http://m.homedepot.com/p/Reflectix-4-in-x-50-ft-Expansion-Joint-for-Concrete-EXP04050/203151902. The top has a tear off strip for the caulking gap needed. Well I think that it would be really silly to remove stone wall (I can imagine that it is beautiful decoration).Also, you don't want to pour concrete on the wall. Instead you will make some sort of dilatation between both house and the stone wall. For this purpose you can use thin (like 1cm 0, 4 inch or thinner) Styrofoam. Place it around the stone wall and on the house wall where it meets the patio before pouring the concrete. After that when concrete has hardened remove Styrofoam with some sharp tool and fill in the gaps with either bitumen or some specialized product. I would also recommend that you apply this procedure for every 10m2 or so just to avoid cracks in the concrete caused by temperature differences. One last thing: when you pour a concrete after 5-6 hours when it hardens a little water it with a garden hose every couple of hours during the day. When you do that make sure that stream of water is not strong (direct) but dispersive so it wouldn't wash off the cement. Make sure that that you pour plenty of water (until pools of water appear) this is also in order to prevent cracks in concrete. Your house has stone walls? Like a castle? Very hard to believe, but it would be impressive if true. Anyway, regardless of whether your house is made of masonry block with a fake stone veneer or is really of stone, you cannot pour concrete against the wall unless both share the same footing. 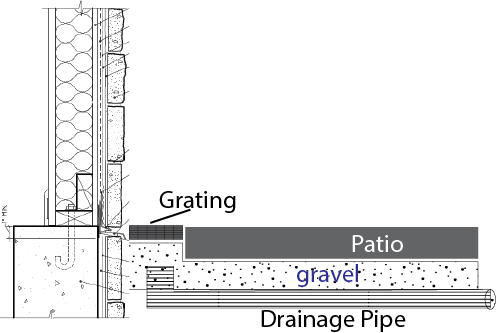 With no joint footing, even if the subsurface was very stable it would not work because water would eventually get between the wall and the patio and undermine the subsurface and then bad things would begin to happen. How can I level my basement floor, which has a 4-inch dip? How do I replace the exterior wall without damaging the siding? How can I attach pony wall to surface of platform and will it be strong enough against lateral forces?